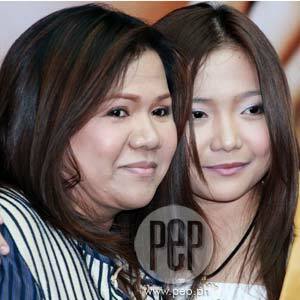 Charice and Mommy Raquel mesmerized the media with their duet of the song "You and Me Against the World" during the press conference for the album My Inspiration. When asked what trait she inherited from her mother, Charice quipped: "Height? Hahaha! Seriously, lakas ng loob kasi ilang beses na akong binabatikos pero yung pagiging matapang ko nakuha ko sa kanya." Foreigners have difficulty pronouncing the name Charice Pempengco, which is why American TV host Oprah advised the young Filipina singer to just use Charice as her stage name. Charice, who will turn 17 years old on May 10, has recently released her second album under Star Records titled My Inspiration. The young singer candidly admits that this two-disc album is dedicated to her mommy Raquel who has single-handedly raised her and her 14-year-old brother Carl. This is the follow-up project to her self-titled debut album that turned Platinum about two months ago. My Inspiration has the carrier single "Always You," an original composition by Jonathan Manalo that is based on the hardships and triumphs that mother and daughter faced throughout the years. During the press conference of My Inspiration held yesterday, May 5, at the 9501 restaurant of ABS-CBN, Charice revealed why this 12-track album is close to her heart. "Espesyal po ang album na ito hindi lang para sa mommy ko pero para sa mga mommies sa buong mundo na naghihirap para sa anak nila." When asked to name her favorite song in the album, she says that she likes the duet that she did with Mommy Raquel titled "You and Me Against the World." To show her support for her daughter, Mommy Raquel bravely sang the duet during the press conference, clearly showing where Charice's singing skills originated. Reporters curiously asked Charice if she has had any communication with her father. She responded by saying, "Actually, nakikita ko lang yung picture niya dati pero hindi ko po alam ang itsura niya ngayon, kung naaalala niya pa ako or kung natutuwa or proud ba siya ngayon sa akin. Hindi po siya nagpaparamdam pero siyempre nagpapasalamat ako sa kanya." Her father left them when she was just three years old. Now, Charice is known internationally and locally for her being the "little girl with a big voice," as coined by her consultant Oprah. But in the future, Charice would want to be known as a singer-songwriter, which is why she has already started composing her own songs. One of the first songs that she did is titled "Amazing," which is again inspired by her mother. NO FORMAL LESSONS. Mommy Raquel constantly accompanies Charice to her gigs and here and abroad. She makes it a point to coach her daughter and tell her the mistakes that she did during her performance. PEP (Philippine Entertainment Portal) was able to interview Mommy Raquel last Sunday, May 3, during the 30th anniversary of CDC Manufacturing Corporation, the company that produces Melawares dinnerware. She reveals that her entire family is musically inclined but she did not take up formal lessons. Mommy Raquel used to be a band singer and she herself taught Charice how to sing. "Bata pa lang ‘yan, narinig ko siya minsan kumakanta siya ng ‘Happy Birthday.' Ang taas-taas ng pitch ng boses niya. Nung four years old siya nahuli ko siya kumakanta kahit hindi pa siya marunong magbasa. Pinakikinggan niya yung mga tape ko noon at karaoke. Yun ang pinakikinggan niya palagi hanggang namemorize niya yung lyrics ng ‘My Heart Will Go On.' Yun ang unang-unang narinig ko sa kanyang kanta." Does Charice know how to read notes? "Hindi, ngayon lang siya nag-aaaral kasi ngayon lang siya tinuturuan ni David Foster." To schedule her gigs in the United States, Charice has a manager named Marc Johnston, the same person handling the careers of David Foster and Andrea Bocelli. Oprah, who is actually a consultant of Charice, has been instrumental in giving big breaks to the petite singer. She also recommended that her young ward should have her own stylist so they employed Tracy, who also happens to be the stylist of American Idol Season 4 winner Carrie Underwood. Now that she is already earning her own money, the press asked Charice what investments she has already made to secure her future. She reveals that she already has her dream vehicle, a white Ford Expedition; a seven-door apartment in Laguna; and a fully furnished house in Tagaytay. This is in addition to their condominium in Lions Park Residences in Parañaque City. The singer will also be releasing a fragrance line called Charice to be released soon by CDC Manufacturing Corporation. Now finished with third year high school, Charice wants to take up law in the future. "Na-inspire po ako sa entertainment lawyer ko po, si Ed Shapiro. Super nice lang po niya, kasi kahit na ang taas ng antas niya, para lang po kaming barkada." MAY 9 CONCERT. Charice and her mother will be leaving on May 7 for the United States in preparation of the May 9 concert that will take place at Mandalay Bay, Las Vegas. Titled David Foster and Friends, this event will also feature Clay Aiken, Philip Bailey from the chart-topping band Earth, Wind & Fire, Brian McKnight, and Peter Cincotti. She is also slated to perform in Italy on May 22, 2009. Charice's second album under Star Records, My Inspiration, is a wonderful gift for Mother's Day. Grab a copy in record bars nationwide.